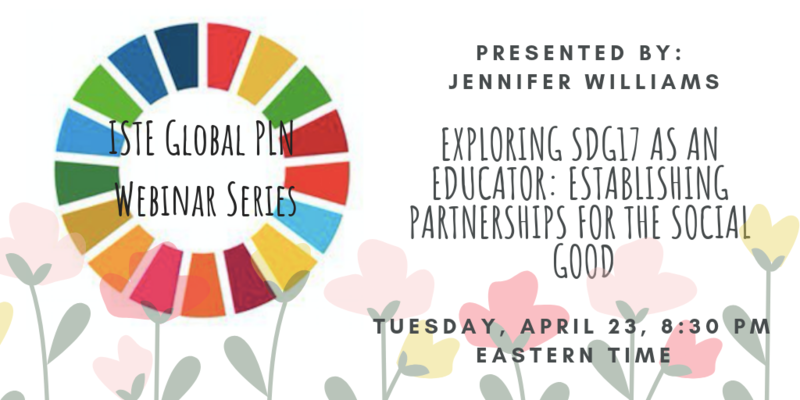 ISTE Global PLN proudly announces the upcoming webinar on "Exploring SDG17 as an Educator: Establishing Partnerships for the Social Good" with Jennifer Williams. About the webinar: How might we as educators be inspired by SDG17? Let's take action on Global Goal 17: Partnerships for the Goals! In this interactive session, we will outline ways to use technology to establish local and global partnerships to bring focus to social good in the classroom and in our world. When: Tuesday, April 23, 8:30 pm, Eastern Time, USA or check your date and time by clicking on this link. Dont miss this webinar. If you cannot attend 'live',please register as you will be emailed the link to the recording after the event.